"Imagination is the real and eternal world of which this vegetable universe is but a faint shadow." Sometimes a book chooses you. Sheltering from the rain in Black Gull Books in East Finchley, I browsed the poetry section, arranged alphabetically by author, until a familiar surname leapt out at me. I knew Mervyn Peake for his fiction and illustrations, but not his poetry. The opening image from The Rhyme of the Flying Bomb stopped my breath--an infant curled up, crying out into inky blackness. It recalled to me, simultaneously, the earliest images of our son in utero, and our own anguish at his death. I read the first few musical stanzas about Mervyn's babe "born in the reign of George", during the height of The Blitz, down to where "the murderous notes of the ice-bright glass / Set sail with a clink of wings". It reminded me of one my favourite lines by one of my favorurite poets, the moment in William Blake's "The Tyger" "when the stars threw down their spears / and watered heaven with their tears". And a ton roared down to the crypt. And in the middle of it all, "... the babe that was born in the reign of George / Lay asleep in the sailor's arm, / With the bombs for his birthday lullaby / And the flames for its birthday dream." The sailor discovers "the tick of its heart beat quick" and tries to protect the infant, whom he affectionately calls "little fish", declaring "We'd be far better off where the soldiers are / Than naked in London town / Where a house can rock like a rocking-horse / And the bright bricks tumble down." When the infant opens "its new-born eye / To the shuffle of the warm, red, restless air / And the dazzle of the witchcraft sky", the sailor entertains him by dancing. 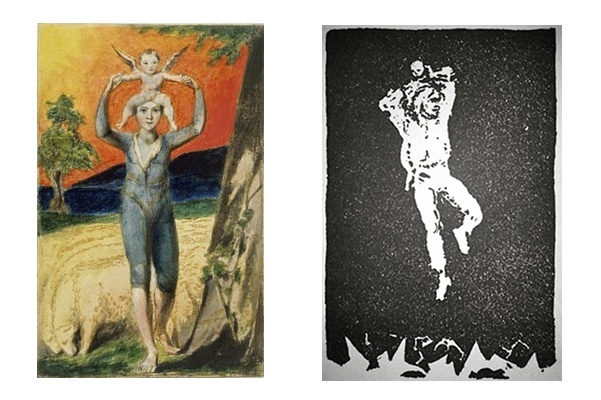 This image, of the sailor dancing with the Christ-like child, is as startling and archetypal as the frontispiece to Blake's "Songs of Experience." That you could be rich like me. As the dying sailor's visions in the church become increasingly hellish, the infant explains the enduring nature of love, and that the sailor's death will be the ultimate proof of his love for the child. From the peak of the falling spire. Lay coiled in the womb again. This long poem was written in 1947, nearly two years after Mervyn Peake was sent as a war artist to the newly-liberated concentration camp of Bergen-Belsen, where he produced images of the dying. His son Sebastian later described this experience as "my father's 'Heart of Darkness'". Rich with Catholic symbolism and fantastical imagery, written in well-tuned metre and alternating rhymes, this poem must have been considered out of fashion when it was finally published in 1962, at the height of the vogue for more plain-spoken poets like Robert Frost. Yet The Rhyme of the Flying Bomb is, at its essence, a timeless and ambitious act--reconciling worldly atrocity with the beauty and magnificence of the human spirit. I do not know if Mervyn is a relative, since I can only trace my paternal line back to an itinerant great-grandfather. But in coming into possession of this book, it seems as though an artistic ancestor has reached through time to deliver this at once dazzling and disturbing vision, showing, as Peake himself put it, "man's continuing hopefulness in adversity." I read the book aloud to my wife. At the end we turned to one another with tears in our eyes, as if to ask, "What on Earth was that?" Mervyn Peake's epic poem is nothing on Earth at all, but something that transcends it--an allegorical vision of enduring love "[at] the height of a world at war." For both its personal and artistic significance, I am grateful to a Peake I never knew. Categories: Books and Poetry. Tags: WWII. Poets: Mervyn Peake.